Battlefield 1 Update 1.18 is available on PS4, Xbox One, and PC. The new Battlefield 1 1.18 update includes Turning Tides – North Sea DLC and Base Game Update. 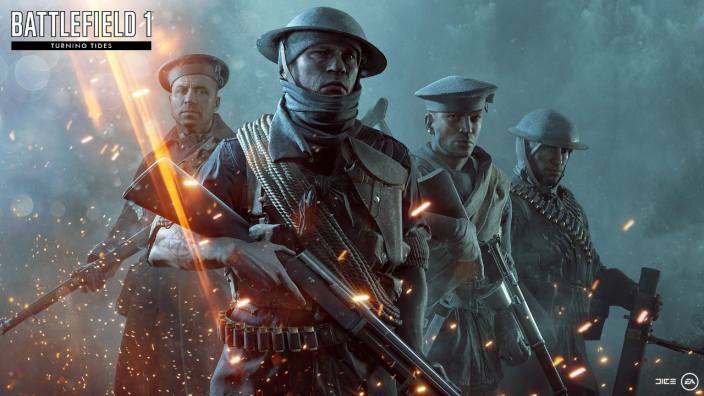 The North Sea content will be limited to Premium Pass and Battlefield 1 Revolution owners for their 2-week Early Access. In addition, the base game update includes various bug fixes and game improvements. Check out the patch preview below. The second wave of Battlefield 1 Turning Tides is here! Fight alongside the formidable German fleet or test your mettle among the British Royal Marines in dramatic naval clashes. Opposing armadas struggle to gain the upper hand to exhibit supremacy over the high seas. 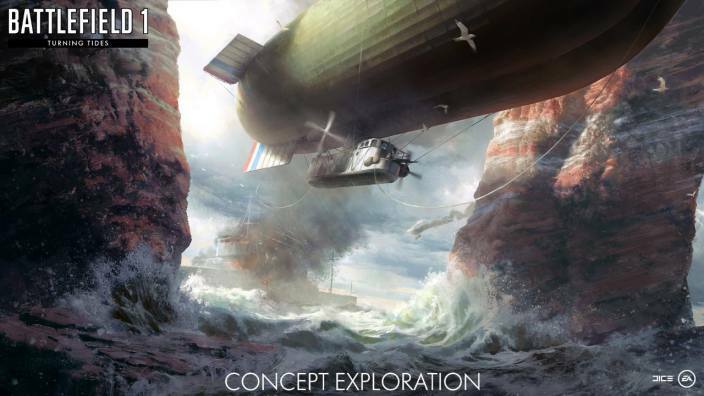 Battlefield 1 Turning Tides – North Sea is bringing new maps, the fearsome C-Class Airship, and continued improvements to Battlefield 1. We hope you enjoy taking command of the sea, air, and land in the battles that turned the tides of war. Available to Battlefield 1 Premium Pass owners* and owners of Battlefield 1 Turning Tides. This is Battlefield 1’s quintessential naval map. With its immense scale and focus on vehicular combat, it’s ideal for Conquest Assault, the only game mode available on this map. Under the veil of night, British troops reinforce the treacherous raid on the Belgian port of Bruges-Zeebrugge. Join the concentrated battle as the British Royal Marines wrestle to possess the German controlled, concrete mole. Advance past the war-torn breach toward the heavily guarded submarine pen. Utilize the dock openings to gain access and overcome the enemy. Torpedo boats, planes, L-Class Destroyers, Dreadnoughts, and the menacing C-Class Airship battle for control around the port. Be mindful, as infantry soldiers fight back with the anti-aircraft guns placed along the coastal wall and battery cannons that are lining the nearby beach at the base of the mole. The all-new C-Class Airship is equipped with 4 seats and 2 package loadouts. Pilots can deliver an immense payload of artillery and bombs, as they navigate the skies. Front gunners are equipped with a 76mm cannon, while rear gunners provide support with a 20mm Autocannon. Top gunners offer anti-aircraft protection with a mounted AA gun on the top of the vessel. Like tanks and the new L-Class Destroyer, pilots can self-repair the C-Class Airship to maintain dominance in the sky. Don the characteristic blue uniforms of the British Empire’s elite naval troops, the admirable Royal Marines. With the addition of new weapons from each expansion pack and the growing community of skilled players, we found it necessary to rebalance the weapons to increase the pacing of combat and balance the loadout options among and between the various classes in Battlefield 1. These changes are far-reaching, across the breadth of Battlefield 1 weapons, which may be difficult to feel when trying them out for the first time. There are a lot of changes, which may not be noticeable immediately and may only become more apparent with time. Players should find a faster time-to-kill (TTK), be more capable in out-numbered scenarios, and find greater distinction between different weapons and weapon types. They have suffered from inconsistency due to how shotgun pellets work, which we’ve improved by reducing how much randomness plays a part in the shotgun dispersion. All shotguns now fire 12 pellets. The dispersion is now broken down into 12 sectors, 6 in an inner circle and 6 in an outer ring. Each sector will contain 1 pellet. This ensures that all 12 pellets are more evenly spread over the dispersion cone, and prevents all the pellets from bunching up in one area, which could cause lucky one hit kills at longer distances, or inversely result in a complete miss. Vehicle damage performed by K Bullets fired from the Martini-Henry sniper rifle are now properly tracked for the Overwatch Service Assignment. Reduced the requirements of the Ribbon of Justice from 5 kills in a round to 2. The player outlines now comply with the colorblind settings. Battlefield 1 update 1.18 added custom colorblind color settings in the video options. Players can customize the size and opacity of world icons in the gameplay options. Hit indicators can be customized with different colors for critical hit kills. Detailed mini-map/full map customization is now in the gameplay options. Vehicle spawn logic has been changed to allow players to select the spawn point even if a vehicle is not available, which will allow players the opportunity to customize vehicles at the deploy screen more often. Farquhar-Hill damage drop off started at 34 but now is 46.33 meters. Farquhar-Hill damage drop off ended at 52 but now is 59 meters. M1907 SL damage drop off ended at 55.6 but now is 60 meters. Autoloading 8.25 damage drop off started at 19.5 but now is 16 meters. Autoloading 8.25 damage drop off ended at 40 but now is 45 meters. RSC 1917 vertical recoil has been adjusted from 1.8 to 1.5 degrees. RSC 1917 horizontal recoil has been adjusted from 2.2 to 1.8 degrees. RSC 1917 rate of fire has been adjusted from 163 to 179.9 bullets per minute. Increased the 3-hit kill range of the Cei-Rigotti by 10 meters. Adjusted the spread for LMGs. LMGs and SMGs now have slightly increased vertical recoil. The vertical recoil bonus on the Storm variants for SMGs and LMGs have been reduced slightly. The SMG 08/18 Optical’s first shot spread multiplier has been reduced. LMG bipods will now remove spread increase while firing entirely when mounted with a lower reduction in horizontal recoil. Overall this change makes heavy MGs with high first shot spread multipliers benefit slightly more from the bipod, while high fire rate LMGs with high horizontal recoil will receive less benefit. Increased the 2-hit kill range of the Russian 1895 Trench from 47 to 70 meters. Increased one hit kill headshot range of the Russian 1895 Trench from 41 to 64 meters. Cavalry Russian 1895 2-hit kill range has increased to 90 meters. Cavalry Russian 1895 one hit kill headshot range increased to 84 meters. Fixed an issue where the Infiltrator Elite flare would brighten the entire level for the opposing team. The K Bullet system, and the damage dealt, was refined for the M91 and Carcano. Fixed an issue where occasionally empty shells would not eject from the Carcano. Fixed an incorrect recoil decrease for the Maschinenpistole M1912/P.16. Battlefield 1 version 1.18 fixed a lower than intended recoil decrease on the Arisaka. Fixed an incorrect recoil decrease for the M1917 Trench Carbine. Fixed the accuracy of the M1917 Trench Carbine when crouching, moving, and shooting from the hip. 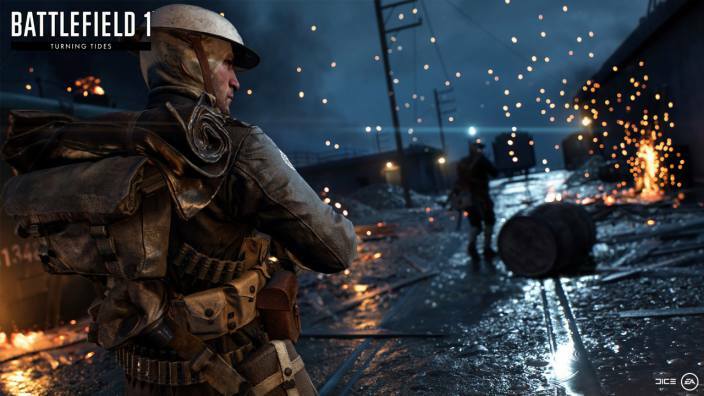 Reload timers were fixed for the M1917 LMG by removing the artificial delay on the short reload. Battlefield 1 1.18 fixed an issue with the AA sights on the M1917 MG where the rear sight wasn’t properly attached to the feed tray cover. Improved alignment of the iron sights of the FA Automatic. Fixed an issue causing shotgun damage and audio to be spread across multiple frames. Reduced the inner blast radius of the Martini- Henry grenade launcher, on the Infiltrator Elite Class, from 2 to 1 meter. Battlefield 1 update 1.18 fixed a bug where the Martini-Henry grenade launcher did not use its arm time, resulting in higher than intended damage. Reduced the ammunition count of the Martini-Henry grenade launcher from 21 to 11. Battlefield 1.18 reduced the reload threshold for the Martini-Henry grenade launcher. Fixed a bug that allowed the Bristol Attack plane and Ilya Muromets Heavy Bomber to utilize weapons from multiple packages. Battlefield 1 1.18 update increased the mine removal radius for the A7V Heavy Tank. Greatly improved the reliability of the AA guns when firing against bombers from certain angles. AT Rocket Gun, and similar weapons, can now be fired from the passenger seat of vehicles. AT Mine damage has increased by 50%. AT Mine radius has been adjusted to 2 meters. Tripwire Mine – HE deals twice as much damage to sprinting players. Tripwire Mine – Gas has a small 15 damage explosion when tripped – dealing damage to player who may already be wearing a gas mask. This damage is doubled for sprinting players. Battlefield 1 version 1.18 removed all Elite Classes from War Pigeons mode. Fixed an issue where several weapons were causing unwanted dips in ambient SFX volume in certain parts of Cape Helles. Battlefield 1 update 1.18 increased visibility of boat wakes. Fixed an issue that would allow Defenders to spawn airplanes in the third sector of Cape Helles, in Operation Gallipoli. Fixed an issue where the medic primary weapons were not available in the Custom Game: Armored Kill. Adjusted the combat zones in Cape Helles on both Operations and Rush game modes, allowing more pathing and fewer places to camp. Moved the Ottoman plane and torpedo boat spawns in Cape Helles. Adjusted the British boat spawns in Cape Helles. Moved the Defenders spawns in the first sector of Rush on Cape Helles. Battlefield 1 version 1.18 adjusted some problematic spawns in Conquest on Achi Baba, to avoid spawning in high traffic areas. Fixed squad spawning on the final objective of Rush on Lupkow Pass. Fixed some bugs related to players being disconnected while connecting to a game server. Added an RSP option that allows removal of the delay that spectators experience so that things are witnessed as close to real time as possible. Battlefield 1 1.18 added a toggle to turn off/on the pre-round minimum of 6 players. Increased the ban list size to 200 (from 100). Increased the VIP list size to 50 (from 20). Battlefield 1 update 1.18 increased the admin list size to 50 (from 20). Fixed an issue that allowed the player to use some Pistol Carbines while swimming. Improved inconsistent slowdown on steep hills. It now occurs on movement direction, instead of the direction you’re facing. Slowdown will occur when climbing diagonally, as well as directly up/down a hill. Corrected slowdown when climbing up hills backwards. The game will no longer expose interlaced video modes in the PC video options. If you have previously experienced blurry output on PC due to the game running in a full screen interlaced mode, please re-select a mode in video options to update your profile settings to use a progressive display mode. Fixed a bug where certain VFX would trigger when colliding with invisible geometry. Battlefield 1 version 1.18 fixed an issue with VOIP volume option not behaving as intended. Fixed a bug where spectators would be kicked from the game if the last player left. Removed some of the female Russian Scout spotting lines that mentioned German soldiers and vehicles. Fixed an issue where Russian self-voice says “tank” when spotting a Scout soldier. Battlefield 1 update 1.18 addressed an issue where players occasionally encountered a loading loop the first time they tried to launch a Single Player level after playing through the Prologue. Check your game update and download the latest Battlefield 1 1.18 update on PS4, Xbox One, and PC. I’m realoly enjoying thhe theme/design of your web site. about my siote not operaing correctly in Explorer buut looks great in Firefox. I love reading through yyour blog and look forward to all your posts! Verry good post. I will be going through some of these issues aas well..
community. Your web siote provided us with valuable info to work on. Yoou have performed an impressive activity and our entire neighborhood will likely be grateful to you. It’s actually a copl and helpful piece of info. us. Please stay uus up to date like this. Thanks for sharing. how to make your site mobile friendly? My website looks weird when browsing frim my apple iphone. excellemt issues altogether, you simply recxeived a emblem new reader. What’s up, just wznted to terll you, I liked this post.